In spite of French presence in India for a couple of centuries, trying to find Indian curry in France tends to be a bit of a chore. The first Indian restaurant didn’t open in Paris until 1975. Those in the know (mostly British expatriates pining for curry in London) lament the lack of good Indian food, although there’s an occasional stampede to certain Indian restaurants in parts of Paris, only to find that the owners are Pakistanis. And Richard C. Morais’s delicious novel, The Hundred-Foot Journey (2010), although fiction, documents what happens when French and Indian cuisines clash. Because France also colonized parts of the Caribbean, most people in France with experience of curry identify the taste with Caribbean Colombo, a Creole curry from Martinique and Guadeloupe. Lest you still think French curry is an oxymoron, think back to Gourmet magazine (oh, how I miss that one) and an August 2008 article written by Kemp M. Minifie. Minifie first tasted vadouvan on top of some salmon, at a Parisian restaurant, Le Chateaubriand. And the rest is history. Vadouvan, sold by Indian grocers in the Velan market in the 10th arrondissement, in the Passage Brady, now sits on the spice shelf alongside the quatre épices and fines herbes. Related to a masala mixture from Pondicherry called thalippu vadagam (see recipe HERE), vadouvan took American culinary media, if not by storm, at least for a bit of a ride for a while. Preheat oven to 350ºF with rack in middle. Grind fenugreek seeds in grinder or with mortar and pestle. Add to onion mixture along with remaining ingredients, 1 Tbsp salt, and 1 tsp pepper and stir until combined. We’ve also got a web-exclusive recipe using the leftover vandouvan. When I made this, I used red onions, and the spice mixture turned out darker than I expected. BUT when thrown into a bit of shimmering chicken fat and stirred about with rinsed fresh spinach, oh boy, the resulting flavor astonished me. Just one tiny taste made the time it took to make vadouvan was well worth it. Yellow or white onions result in a more golden color, thanks to the turmeric. And just in case you’re in Paris now, or will be soon: Those in the know say that Saravana Bhavan (a chain of Indian vegetarian restaurants) on Rue du Faubourg St. Denis and Krishna Bhavan on Rue Cail serve passable Indian food in Paris. 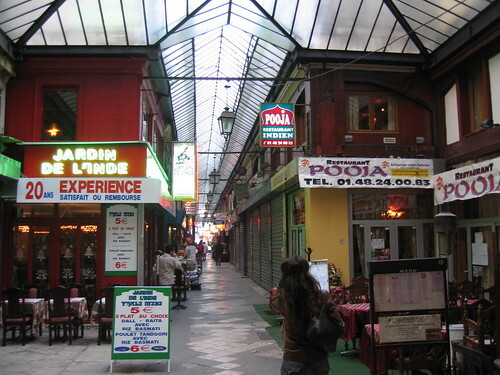 Others say that a restaurant called Passage de Pondichéry is the place to frequent. Well, there’s always next time … right? I just had a realization while reading this: I’ve never really been in Paris long enough to want to eat other than French food so haven’t actually considered eating non-French food (the exception probably being Moroccan food). Interesting to read this, and learn more about Indian food in France, and the French in India.